Once a season [starting with this one], SUILTSOY takes a peek behind runways left slightly unguarded. This season, the Wide-Eyed, Newly-Employed Blogger w/ A Ridiculous Joanna Hillman Obsession: Female, online content lead, Chelsea, 25, straight, single, stylish. 6 a.m.: My alarm goes off, but I've been dreaming that I'm laying in bed awake - worrying - all night. It's the day of the IFB Conference and I've only been with the company a couple of weeks. To say I'm nervous would be the biggest understatement in NYFW history. I was working until 11 pm last night, and up until 3 a.m. outfit-plotting and generally fretting. 6:10 a.m.: Bleary-eyed in the mirror, I fashion my hair into the top-knot I've done at least 100 times. Thank god muscle memory is guiding me because my brain is no help. 6:15 a.m.: The outfit I spent hours agonizing over last night is hanging neatly all on one hanger: H&;M sleeveless blazer, vintage Missoni skirt, Steve Madden gladiator heels; thrifted statement necklace. It's functional, fashionable and comfortable - and I am overly proud of this. I dress in two minutes. 6:35 a.m.: I'm breezing down 8th Avenue towards Milk Studios (in ballet flats, with heels in tote), the adrenaline starting to kick in. 8:40 a.m.: The morning has been hectic and exciting. Time to switch to heels. Grateful to the young volunteers who made a coffee run. 9 a.m.: Meghan is here to speak and to work - a familiar face amongst a see of blog names and well-dressed girls I can't totally match up. 12 p.m.: The conference is going well. My feet are numb. The bustle and backstage controlled chaos is so exhilarating I'm almost too jittery to eat. Almost. Veggie sandwich and coconut water. 4 p.m.: Things are still in full swing, I am still in heels. Tweet, take a lap, tweet, repeat. 4:15 p.m.: Ugh, Magnum Ice Cream bar. 6 p.m.: Keynote speaker Joe Zee is interviewed by Tina Craig (BagSnob) and the crowd is delighted. Hell, I'm delighted. And still in heels. 7 p.m.: I photo-bomb Nubia, Debie and Joe Zee. It's awkward, and worth it. 7:02 p.m.: Ballet flats. Still feels like heels. Or numb, I'm not sure. Clean up and wrap up everything. 7:30 p.m.: I'm supposed to be at the KMS after party. I'm at Chipotle. 8 p.m.: Cab to Rivington Hotel.Ugh. 8:10 p.m.: Find Meghan. Find co-workers. Consume bourbon cocktail. 8:25 p.m.: Debie and I are in a cab back to the West Side (oodles of KMS swag in tow). 9 p.m.: Have already been asleep for 10 minutes. 9 a.m.: Somehow made it to the office. It's sunny and I'm wearing rubber boots. And shorts. And a Ralph Lauren cable knit sweater. I don't even know. 1 p.m.: Jennine, Nubia and Nando are at the shows at Milk Studios. Debie and I get lunch from the Chinatown diner around the corner. This fountain Diet Coke is like nectar of the gods. Spend the rest of the afternoon deliriously working and hoovering Jelly Belly beans. 8:45 p.m.: With Tully and her mom in tow, I make it to Tretorn in Soho just in time to see my Nylite Project photos on display before the party ends. 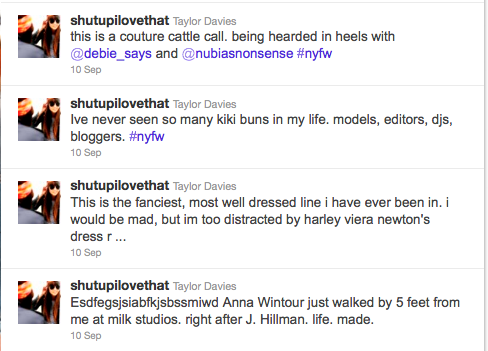 FNO is the NYE of NYFW, and I will never participate on this level again. The streets and crowds in Soho are just the worst. 11 a.m.: Step into Milk elevator next to Joanna Hillman. [It went like this.] I'm officially high on fashion week. 11:30 a.m.: Mischa Nonoo presentation makes my heart leap for spring fashion. 1 p.m.: Meet Lawrence and Justin in the lobby and escape to the Maritime Hotel for a quick al fresco lunch. They wax philosophic about menswear nerd stuff and like it. They brief me on their phenomenal Tumblr project, In Passing, and I'm impressed. The sandwich, sunshine and great conversation are life-giving. When I mention to Justin how excited I am to stay in and relax tonight, he informs me that there's a menswear blogger's birthday party at Anchor Bar and if I'm single and like well-dressed dudes I should probably be there. I've never met him before, but this guy seems to get me. 5 p.m.: Dash home from Milk to change before 6 p.m. Nicole Miller show at Lincoln Center (thanks to Lauren!) because it's rather hot out - but not before getting a quick snap by Justin. 5:35 p.m.: Frantically clop down the stairs of my apartment building in 5-inch platforms and run into my neighbor. Tell her I'm off to a show which triggers the memory that I've forgotten my ticket upstairs. Evidently, I don't have my keys either. Buzz roommates. 5:38 p.m.: Racing down the stairs of my apartment building in flat tassel loafers whilst digging in my bag for my phone so I can text Meghan that I'm on my way. Dammit. 5:41 p.m.: I'm literally jumping down the stairs of my apartment building and leaving a frantic phone message for Meghan. 6:05 p.m.: Smooth my hair, pack my Persols away and steal a quick gaze at the fountain before popping inside Lincoln Center. Chat briefly with Sonia, wave to Meghan, note that Ashley Tisdale is being swarmed by photographers. 6:30 p.m.: Graphic patterns, silky jumpsuits and bright colors come down the runway. 6:50 p.m.: Snap street style pictures of Meghan, Sonia and Taylor Sterling before dashing back down to Milk for the Suno show. 8 p.m.: Introduced by Jennine to Susie Bubble. We mill around and watch the practice runway and pre-show preparations. I feel like part of a secret club. 8:25 p.m.: Casually sit down in the front row of the photographers pit. Suno show begins shortly after and I am blown away, seduced and delighted. 11:30 p.m.: We arrive at (hot, crowded, dance-y) Anchor Bar and find Lawrence somehow still wearing a shirt and jacket, but he's not the only one. We're jostled around in a sort of buffet selection of handsome, turned out (albeit sweaty) guys - Justin delivered on his promise. 10:30 a.m.: My alarm rouses me suddenly, and I realize I'm expected at a brunch organized by the darling Eliot, with 11 other extremely stylish women in exactly an hour. 11:25 a.m.: Clad in my black Theory paper-bag waist pants, a Banana Republic striped boat neck top and snakeskin ballet flats, I'm stuck in traffic on my way to The Smith. 11:40 a.m.: Passers-by and diners on 3rd Avenue are gawking at the gaggle of seriously well-dressed girls assembling on the sidewalk who are talking excitedly and tapping away furiously on their iphones. 2 p.m.: Meet up with coworkers in Chelsea for "tea" in between shows at La Bergamote. I eat a croissant and down an iced coffee. Why? Because it's Fashion Week and I deserve it and I'm working on a Saturday, ok? 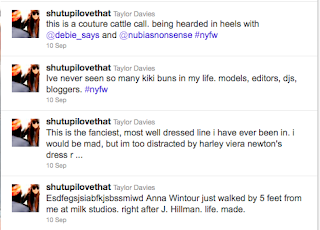 7 p.m.: Waiting outside Milk Studios for passes to the night's presentations (Erin Fetherston and Pamela Love, among others) and I spy my girl crush for all time, Joanna Hillman, and immediately go into shock and grab Debie violently by the wrist: Anna Wintour glides into the building just a few feet from us. Anna MF Wintour. 7:40 p.m.: Debie, Nubia and I make our way though the elevator line (which takes forever) and we're seriously too entertained to care about the wait. 8:15 p.m.: We jostle from room to room, dumbfounded by the models, the clothes, the flowing champagne, the editors, the clothes, the music and the fact that people are chain-smoking indoors in the 8th floor Kanon Vodka bar. 9 p.m.: Float home in a spring-fashion-fueled haze, douse my hair in KMS dry shampoo (game-changing product, let me tell you!) 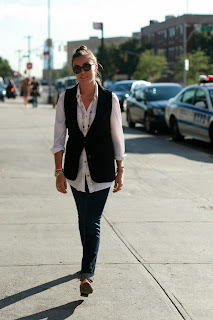 and head out for margs and guacamole in soho with Tully and Alli. 2 a.m.: Arrive home at a "reasonable" hour. 11 a.m.: I have most of the day off, which I spend cleaning my apartment, doing laundry, and catching up on shows on style.com. 6 p.m.: I attend a panel discussion on denim hosted by True Religion at The Standard Hotel. Probably against the intentions of the hosts, the conversation keeps coming back to Levi's, and now I really want a pair. 8 p.m.: Quiet night at home with roommates, respond to 6 days worth of texts from non-fashion friends wondering if I'm alive. 10 a.m.: I arrive at Milk Studios and again camp out in the lobby of the eighth floor. 10:10 a.m.: Oh, there's Terry Richardson, who's photographing in the studio across the way; flannel, glasses, et al. 10:20 a.m.: Linda Fargo breezes by to the loft space down the hall, wearing a fabulous electric pink pencil skirt. 10: 40 a.m.: Anna Dello Russo (and a four-person entourage) storm past. She's in the coolest, craziest little pink dress and YSL wedges. 1 p.m.: Waiting near the photographer's pit for the Ohne Titel show to begin, I watch as Anna Wintour, ADR, Joanna Hillman, Carine Roitfeld, Emanuelle Alt, Lauren Santo Domingo, Bill Cunningham, Giovanna Battaglia, and Hamish Bowles, all file in, air kiss and take their seats. I'm ushered from my standing spot to a seat in the second row, where I have a prime view of the Annas. The show is cool and fresh, but more conceptual than wearable to me. 2 p.m.: Outside Milk after the show, we see Bill Cunningham ride off on his bicycle. I am struck by just how magical it is to be a part of all this madness. 8 p.m.: As Debie and I find our seats at Zero + Maria Cornejo, we see Bill Cunningham again, as well as Scott Schuman. Debie decides we should just introduce ourselves to Bill, so we do. He hugs Debie and tells us, "Just do what you love in life." 9 p.m.: Skip home up 9th Avenue, regaling my mom with my NYFW stories. She can't quite believe I'm doing what she once did each year as the Fashion Director of Nordstrom when I was growing up. I think we both know that for exactly that reason, it was inevitable. 8:35 a.m.: As I round the corner on 15th to get on the subway, I see Joanna Hillman across the street from me hailing a cab. She's wearing a black tux jacket with white lapels, black pants, and enormous, bright red tassel earrings. 9 a.m.: Back at the offices in Soho. Browsing tux jackets on Zara.com. 12 p.m.: Leave offices for the 1 p.m. Diesel Black Gold Show, which might as well be in Outer Space, as it is in a warehouse on 52nd and 12th. 1:05 p.m.: I am shlepping down 52nd Street (Seriously. If you look up the word 'shlep' in the dictionary, you'll see me in the blazing sun, avaitors askew, hauling my handbag and camera, with my heavy, floor-length white skirt gathered up around my knees, nose scrunched to avoid the smell of horse manure, making my way to the pier at 711 12th Ave). 1:35 p.m.: From my standing room vantage point, I see Carine and Julia Roitfeld take their seats relatively on time, and a frenzy of paparazzi and photographers swarm on some handsome dude I can't discern and a couple model-looking girls for at least 5 straight minutes just a few seats down the row. 2:15 p.m.: Again, I schlep. It takes a full hour to journey South and East to to office. 3:15 p.m.: As it turns out, the guy and girls being crowded were Gerard Butler, Petra Nemcova, and the singer Oh Land. 6 p.m.: I arrive home my last show day of the week feeling as unglamorous and dog-tired as they come, but pretty damn grateful and inspired all the same. TOTALS: 1 blogger conference, 8 fashion shows / presentations, 4 Joanna Hillman sightings, 2 Anna Wintour / ADR sightings, 1 conversation with Bill Cunningham, 1 lunch with two menswear nerds, 1 brunch with 11 bloggers, 2 schelps, and 7 days of fashionable insanity. *If you don't understand the format I'm playing off of here, you need to spend some quality time with these. Love the post. 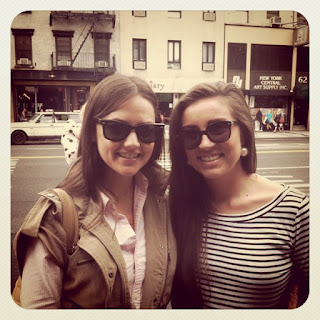 Great recap and I'm so glad we were able to squeeze in brunch even if we were on opposite sides of the table! You lived the life I could only dream of! Been following your blog since your hometown! you inspired me to start my own! Definitely the best NYFW recap I've read. I loved the diary format and all the details. Great post! Would love to see more pictures.